Liverpool eyeing £23.5m Saido Berahino Metro reported earlier today that Liverpool manager Brendan Rodgers is keen to land the £23.5million rated striker Saido Berahino from West Brom. According to Metro's report, Liverpool manager Brendan Rodgers is keen to land the £23.5million rated striker Saido Berahino from West Brom next month. Metro quoted Fichajes artuckes that Liverpool will soon secure the services of Saido Berahino for a fee around £20million. Berahino has told West Brom that he wants to leave the club as many big sides including Liverpool, Arsenal, Manchester United and Tottenham are taking interest. The 21-year-old is considered as one of the best young talents in the Premier League. He has scored eight goals in 21 appearances for West Brom this season. 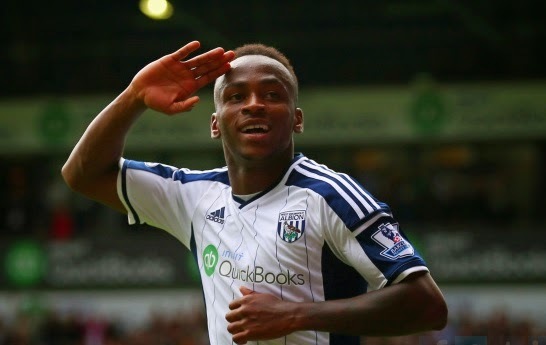 Berahino started from West Brom youth academy and was promoted to first team last season. He scored five goals in 32 appearances last term in Premier League. The Englishman is desperate to join a better club in the coming window which starts in few days. Reports have also linked Tottenham Hotspurs strongly but also claimed that Liverpool are in front of the race. While West Brom manager Alan Irvine has said that he has not received any offers from interested parties. Irvine also added that they will surely listen to offers and could sell him if the right offer comes. However, chairman said in the past that he wants Berahino to stay in January.